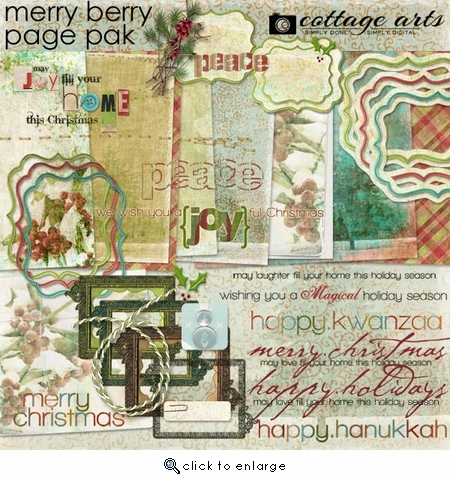 Celebrate the holiday season with this merry Christmas kit! Perfect for making your own holiday cards or Christmas letter, Hanukkah or Kwanzaa greeting, or holiday digital artwork. Includes 9 - 12x12 Papers (collages of pines, berries, distressed solids, layered pine over plaid, layered torn berries over canvas, and plaid) and over 30 elements: pine bough, winter berries, curly frames, curly mats, vintage metal frames, 11 word art holiday greetings, ribbons, tags, mats, torn paper, and more make this a very versatile kit. Photographers, Videographers, Scrapbook Artists, and other digital artists...learn about our Professional Use License option here here.